It's Monday. Welcome back for another edition of Observe and Fight, The Boxing Observer's compilation of observations and random thoughts from the week that was in boxing. Get caught up on some of the most recent events you may have missed out on, including Timothy Bradley signing with Bob Arum and Top Rank, potential opponents for Floyd Mayweather, an evaluation of Sergio Martinez's performance, and much more. Without further ado, check out the latest observations from The Boxing Observer. 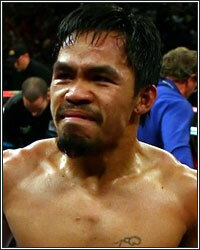 Bob Arum is going to milk Manny Pacquiao for every dollar he can before putting him in the ring with Floyd Mayweather. With news that Timothy Bradley officially signed with Top Rank this week, one can only assume he will be next in line to face Pacquiao after Manny's fight with Juan Manuel Marquez. Bradley, recognized by many as the top jr. welterweight in the world, turned down a near $2 million payday to fight Amir Khan in July. Had those two fought, the winner may have been next in line for a fight with Floyd Mayweather. Now Bradley is in a much easier tune-up fight against faded, former champion Joel Casamayor. A Pacquiao vs. Bradley fight will probably draw one million pay-per-view buys, get Pacquiao another $20-25 million payday, and give Bradley a guaranteed $2.5 million (approximately the same amount Victor Ortiz made against Floyd Mayweather). Bob Arum will once again come away smiling because he will earn more than anyone by keeping everything in house. At what point does Manny Pacquiao take control of his own career and stop letting everyone else speak for him? One of these days, "PacMan" is going to step into the ring with Mayweather (yes, it will happen one day everybody). We all know what has to happen first though. Pacquiao must agree to random drug testing. Something tells me that someone within Pacquiao's inner circle is telling him not to say anything about the drug testing issue. What's the best way for Pacquiao to take control of his career? After another dominant victory, while being interviewed by Larry Merchant live in front of millions of fans, Pacquiao must stand up for himself and say, "I want Mayweather next! I am saying right now that I'm agreeing to random drug testing." If that happens, there is no way Bob Arum can keep this fight from being made. We have all heard Mayweather say as soon as Pacquiao agrees to the testing, he is ready to go. The ball is in Pacquiao's court. If he really wants the fight, he needs to say it loud in front of a live television audience after one of his fights. Not in a press conference, not in an interview in the Philippines, but in front of everyone so there is no speculation. If Mayweather is called out by Pacquiao, and Pacquiao alone, the fight will get made. Simple as that! Golden Boy Promotion's attempt to get Victor Ortiz a rematch against Mayweather is a joke. I've been particularly critical of Ortiz, but if he really felt he was wrongfully knocked out, we would have seen the same intensity and mean streak he brought to the ring against Andre Berto following the loss to Mayweather. He wouldn't have been smiling and laughing in the ring. I've said it once and I'll say it again, Victor Ortiz knew he wasn't going to win that fight and his actions in the ring proved it. A rematch would be a disgrace to boxing. Floyd Mayweather should be keeping a close eye on the November 5th clash between Aflredo Angulo and James Kirkland. Mayweather is already a worldwide superstar and has said he may be willing to go to England to fight Amir Khan. That fight doesn't seem likely until late 2012. Should Angulo defeat Kirkland, Mayweather could make a HUGE payday going to Mexico to take on "El Perro". It would be a fight where Mayweather could build his international fan base, prove that he can beat a much bigger man, and show he is willing to fight a brawler. I believe Angulo would be easy pickings for the quicker Mayweather and Floyd could pot-shot him all night. The fight would definitely make dollars, and therefore would make sense for Mayweather and Golden Boy. Sergio Martinez is the best middleweight out there, but he is not one of the top 5 pound-for-pound fighters in the world. Darren Barker went into Saturday night's fight against Sergio Martinez with the game plan of survival. Stylistically, Barker was not a good matchup for "Maravilla". He exposed Martinez a bit without even trying that hard. Martinez also seemed to get tired in the middle rounds before knocking Barker out in the 11th. A good boxer with a higher punch output than Barker can beat Sergio Martinez. Andy Lee is not ready to beat Sergio Martinez. Though he looked very impressive in his redemption victory over Brian Vera, Lee is not quite quick enough to hang with Martinez over 12 rounds. If the two fight right now, Lee would suffer a similar fate as Barker; a late stoppage. There may not be another middleweight in the world who can challenge Martinez at this point. Emanuel Steward didn't seem too eager to get Lee into the ring with Sergio, so Matthew Macklin may get the next crack at the title. Jermain Taylor will get a shot at Sergio Martinez sometime in 2012. This may seem like a bold statement, but who else can Martinez fight at middleweight that will garner any attention? Taylor was just granted a boxing license in Nevada after being away from the sport for two years following a knockout loss to Arthur Abraham in the Super Six tournament. Most believe Taylor should never have been fighting in the tournament as he is a natural middleweight. Reports claim that Taylor is already in top shape and ready for a fight at 160 pounds. Assuming Taylor can come back and win about 2 fights, where else will Sergio Martinez make a big payday at middleweight? Martinez's promoter, Lou Dibella, used to promote Taylor and the two maintain a good relationship. The fight should be easy to make, HBO would have an easy time promoting it, and the fight would pack any arena on the east coast. It sure makes logical sense to me. Another American was robbed of his title in Europe this past weekend. Cruiserweight Steve Cunningham lost a 6th round technical decision to Cuban Yoan Pablo Hernandez on Saturday in Germany. Cunningham was knocked down in the first round and barely beat the count, but came back to win rounds 3-6 before the fight was stopped due to a cut over Hernandez's eye. While the cut was affecting Hernandez's vision, it wasn't bad enough to stop the fight. Had the fight continued, Cunningham would still have his title belt today. If Chad Dawson's mindset is right, he will give Bernard Hopkins major problems. Dawson is not long removed from being considered the top light heavyweight in the world and is going back to his roots. He is back with trainer John Scully, and having a veteran like Winky Wright in his corner (a man who has been in the ring with Hopkins), will only increase his focus and chances against Hopkins. Not many are giving Dawson much of a chance, but "Bad" Chad will make this a very interesting fight. Don't be surprised to see an upset in Los Angeles. The 4th quarter of 2011 may be what boxing needs to begin its resurrection to prominence. Taking a look at the boxing schedule the rest of the year, there are so many entertaining fights to look forward to. The following slew of stars will be showcased before the end of the year: Pacquiao, Marquez, Hopkins, Dawson, Donaire, Angulo, Kirkland, Bute, Glen Johnson, Ward, Froch, Kessler, Bradley, Chavez Jr., Cotto, Margarito, Mares, and Agbeko. This list doesn't include fights being rumored before year's end with names like Wladimir and "Canelo". If these fights live up to the hype, boxing could be back on top in the world of combat sports by 2012. That's all I've got for now. Send your comments to dkassel@fighthype.com. Be sure to "Like" The Boxing Observer on Facebook, and follow me on Twitter @BoxingObserver.